The Google Play Store is getting a significant design tweak that adds a new feature to the app, but it is still limited to certain sections of the user base. As at the time of this writing, the Google Play Store app has received a new Notifications option right below the My apps & games section in the app’s main menu. Here, users of Android devices will be able to see notifications about app updates, Play Store offers and other stuff related to the app. 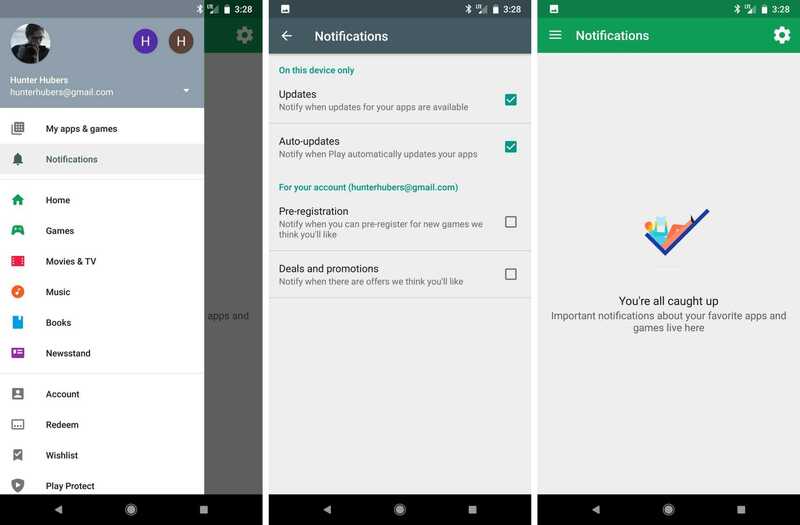 As pointed out, the new Notifications section appears in the Google Play Store menu and when opened, users are reportedly being greeted by an empty page containing the message “You’re all caught up.” This essentially means that this page will group together all notifications related to the Play Store so that managing them is much easier. However, the settings for this section remain unchanged when compared to those you get on the Notifications settings page for the Play Store. Users will be able to receive notifications whenever there is a new update, auto-updates, offers and pre-registration into Play Store programs, which is just about all we can gather at the moment. It’s still unclear how Google plans to use this Notifications section, but it shouldn’t be long before we get a clearer picture.